The first two seasons of the HBO comedy series are planned for Blu-ray this August. 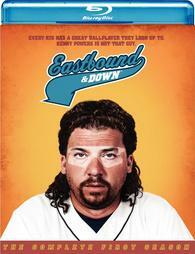 In an early announcement to retailers, HBO will be bringing 'Eastbound & Down: The Complete First Season' and 'Eastbound & Down: The Complete Second Season' to Blu-ray on August 2. The series stars Danny McBride as Kenny Powers, a former major-league pitcher with a massive mullet who brings his shifty shenanigans to a small town in Mexico. Specs have yet to be detailed, but each release will be a 2-disc set and will include audio commentaries, featurettes, deleted scenes, and outtakes. Suggested list price for each season will be $39.98. You can find the latest specs for 'Eastbound & Down: The Complete First Season' and 'Eastbound & Down: The Complete Second Season' linked from our Blu-ray Release Schedule, where they are indexed under August 2.